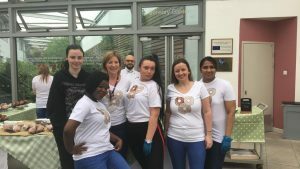 The Professional Cookery Students pose with the winning designer of their t-shirts for Donut Day. 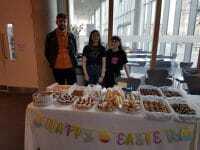 The event was a great success and they sold nearly 300 donuts during the morning break, making £190. This money will go towards resources and a trip for the students relating to one of their units. Thanks to everyone who supported us and we hope everyone enjoyed their donuts. NQ Art, Design & Digital Media's Sarah along with her production team Hamish & Roz created T-shirts for the Catering team's charity donut sale next week. 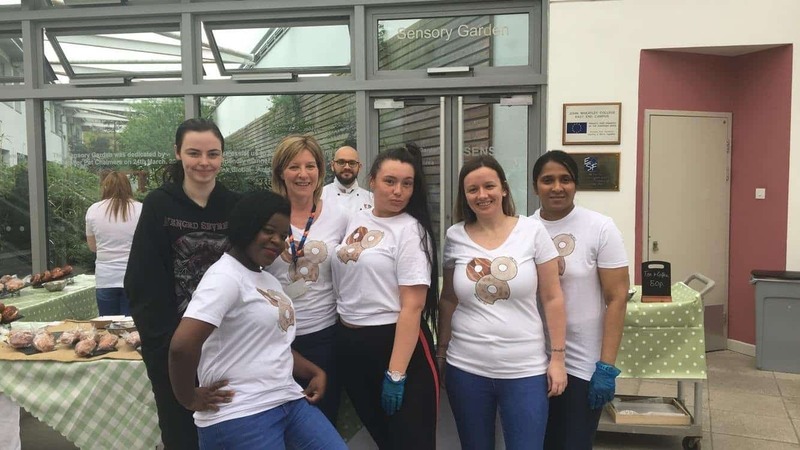 The Professional Cookery Students and the Art students have been working together in preparation for Donut Day on the 9th May in EEC. 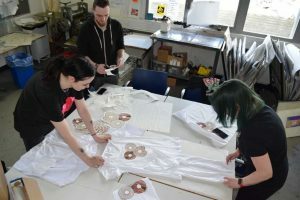 The art students held a competition, judged by the professional cookery students, to design a t-shirt for the students to wear, Sarah and her team won this design competition. 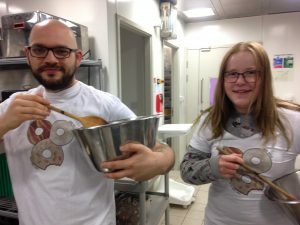 These two level 6 Chefs in the picture are wearing the winning t-shirt. Donuts will be on sale on Wednesday 9th May from 10.15am in the main concourse at EEC. Tea and speciality coffees will be available in the Rowan restaurant. This is an Enterprise event to raise some funds for a student trip. 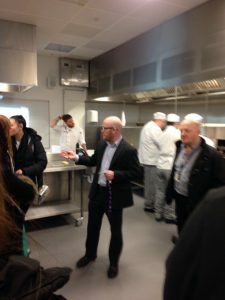 Level 6 Professional Cookery students enjoyed a guided tour at City of Glasgow College yesterday, by none other than Scotland's National Chef - Gary McLean. 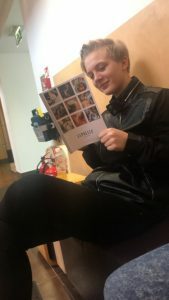 Most of our students have interviews at City of Glasgow next week and enjoyed the chance to hear about the courses, progression routes and what would be expected of them if they studied there. The students sat down and enjoyed lunch in Scholars training restaurant. 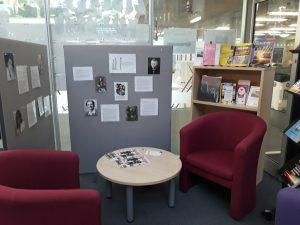 New Look, New Location, New College Stories! Welcome to our new look blog, in its new location, integrated into our new website. Now we have all our information and news in the one place, so once you have finished here, have a look around the site and see what you think. 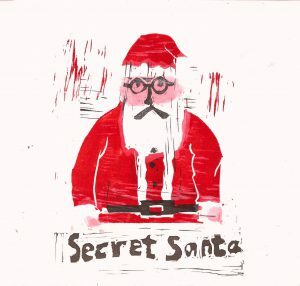 Being the first blog of the new year means we have a few items for you, so we will make a start. 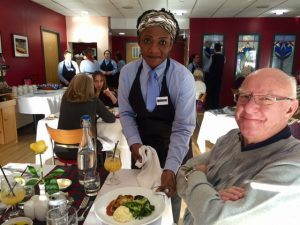 Customers dining in the training restaurant at the Easterhouse campus enjoyed a special 3-course Scottish inspired menu for their Burns' Day Lunch on Friday 26th January. 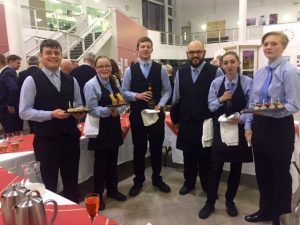 As well as a delicious menu cooked and served by Level 4 Introduction to Hospitality and Level 5 Professional Cookery students, the haggis being piped in by Jacqueline McNab's son, Connor was most definitely the icing on the cake. 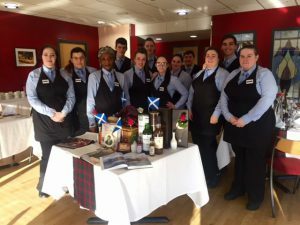 For Drew Murray and Brenda Anderson's students this Scottish inspired theme was the perfect follow up to the pre-christmas St Andrews Day themed lunch and marked an important occasion where food has a strong connection with a Scottish cultural celebration. Well done to all! 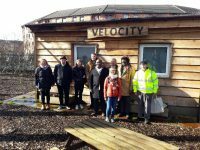 The College Cycling Hub ‘Glasgow Kelvin Velocity’ is a project, led by the Campus Cycling Officer (Agne Buraityte). An idea originating from the Support For Learning students has attracted external support and funding. 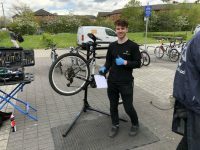 Agne has been working in partnership with Cycling Scotland, Bright Green Business and the College Cycling Project Team to develop and publicise Glasgow Kelvin Velocity. The hub will be officially opened at 10:30am on Friday 16th February by Anna Richardson (Glasgow City Councillor – City Convener for Sustainability and Carbon Reduction). 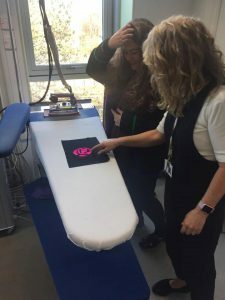 Following a visit to CCA Rona McNicol invited Nyla Ahmad the Public Engagement Officer from BHP Comics visited the SFW Creative Industries level 5 Schools Group recently. 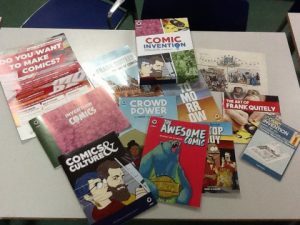 The group presented work they have produced for, "Creative Industries Process" and got feed back from Scotland's only Graphic Novel Publishers, which is hopefully the start of further mentoring which will continue over the next year after the class ends in March. BHP are looking to amplify the export of Scottish Graphic Novels world wide. Their website is www.bhpcomics.com/full-colour. To avoid increased nerves the students did not know who their unexpected visitor was until after their presentations were over! 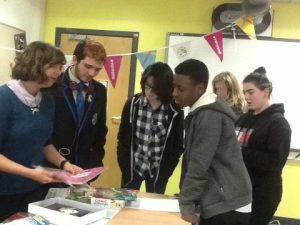 As well as a lot of enthusiasm and inspiration Nyla left behind a wealth of graphic novels for the group to enjoy. 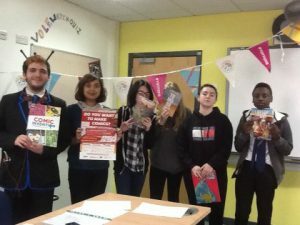 The pupils plan to submit their class projects to the 'Full Colour', mentoring programme and publication, in March which is promoting inclusion of Black and ethnic minority groups in the production of Graphic novels. 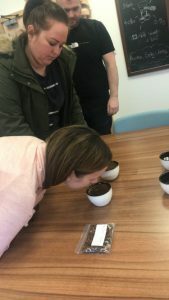 Kelly Coyle's, an ex GKC student, photograph ‘Torn’ was selected as the winner of Nil by Mouth’s ‘Pitch Perfect’ art competition held in conjunction with Glasgow Kelvin College. 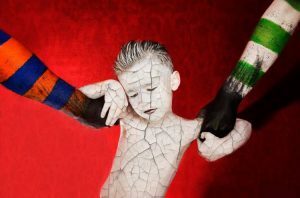 The brief was set by Nil by Mouth and aimed at tackling sectarianism in the west of Scotland and Kelly's image is displayed in St Mungo's museum. As always the photography department continues to impress. For more on ths, visit the Nil by Mouth website. 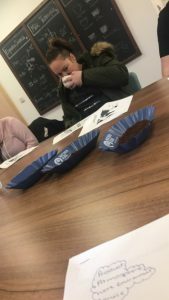 On Monday the 29th of January, Level 6 Professional Cookery students attended Barista Training at Mathew Algies Coffee School. 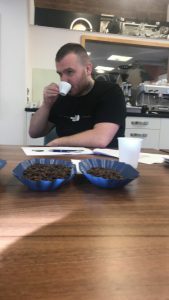 Students spent some time making, sampling and learning about the varieties and delights of coffee. Tuesday 23rd January saw the Community Achievement Team attending the Awards Aware: How Youth Awards Support Attainment, event in the Scottish Parliament. 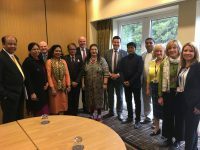 The Keynote Speaker at the event was Shirley-Anne Somerville MSP, Minister for Further Education, Higher Education and Science. 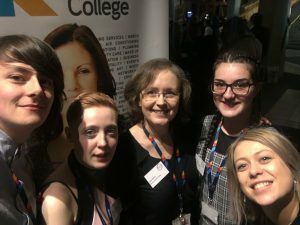 Two of the college's Community Achievement Awards team (Jane Horne and Eilidh lamb) attended the event with three of the young people who volunteer in the Youth Access programme. Leah Cairns is a modern apprentice who started as a Transitions student. She has completed her level 5 Community Achievement Award and is working towards her Level 6 award. She is looking to further her education by completing the HNC in Working with Communities. Megan Hamilton developed an app for homeless young people which enabled her to complete her level 7 Community Achievement Award. Cieran McQuade volunteers in Musical Workshop. He is in first year at university and is working towards his Community Achievement Award level 5. 2018 marks the 100th anniversary of the women in the UK getting to vote. This was a watershed moment in the fight for gender equality, although it wasn’t until 1928 that women were given the same electoral rights as men. 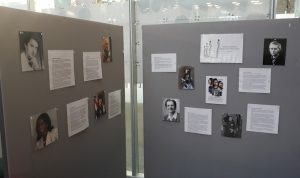 Over the year there will be a number of displays to celebrate this event and this month’s display celebrates the achievements of women in science to tie in with International Day of Women and Girls in Science on 11th February. How many famous scientists can you name? And how many of those are women? There is and has been historically a gender imbalance in the sciences, with more men studying and working in science fields than women. In the past, there were barriers to women even enrolling to study for qualifications in science. While this has got better over the years, there is still a lot of room for improvement, and lack of participation in STEM fields from women and girls is still a real concern. 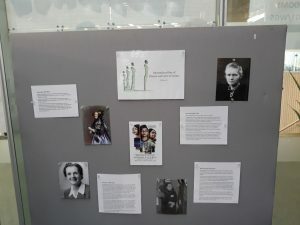 Pop into the Library at Springburn Campus to learn more about a few of the female scientists – such as Ada Lovelace, Marie Curie, and Jane Goodall –who’ve had an impact on our lives, society, and the development of the sciences. 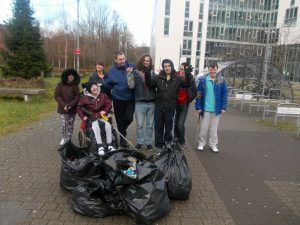 During December the students from Skills for Learning Life and Work carried out a College litter pick. They filled 5 bin bags and made a difference to the look of the College! With a collaboration with another group they plan to do this again very soon. That's us finished for this week and we hope you liked the new look. 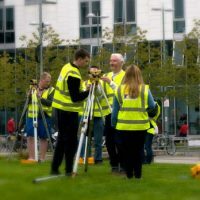 If you would like to contribute anything to future updates, please email Tracey on tborland@glasgowkelvin.ac.uk remember to include any pictures or links you have. Talent and Skills Throughout The College! 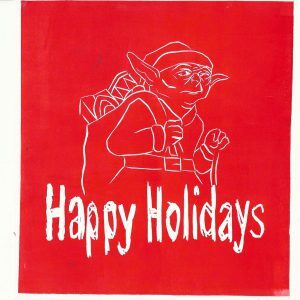 As we rapidly approach the Festive Season and a well deserved break for both staff and students, you would think that things would slow down a bit, but not for our students. Everyone is still involved in a multitude of activities, here are just a few of the things they have been doing. On Wednesday 29th November GKC Fashion Department hosted a schools open day inviting students from Kirkintilloch High, Lochend High, Turnbull High, Springburn Academy, Bearsden Academy, and St Mungo’ Academy into the department for a tour as well as some fun fashion related activities related to the Charles Rennie Mackintosh theme the department are following this year. 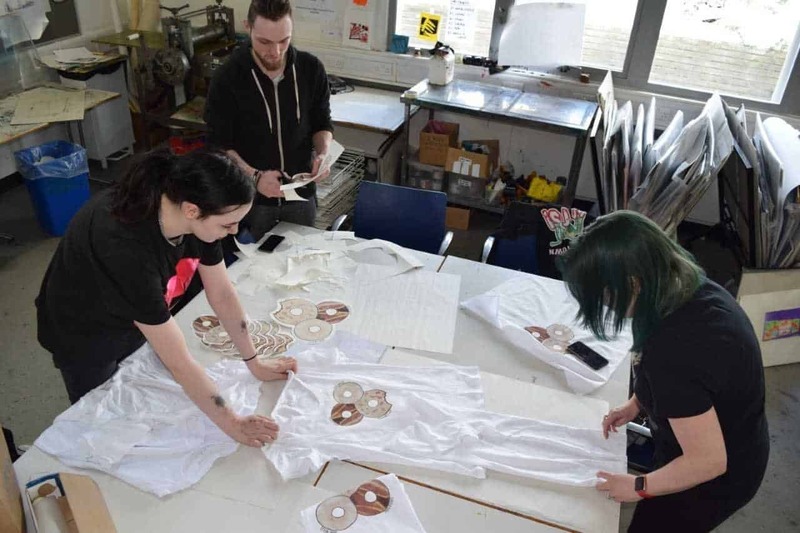 The students all thoroughly enjoyed learning about the courses on offer as well as learning about the possible careers in the fashion industry, some are even hoping to join the department when they leave school! 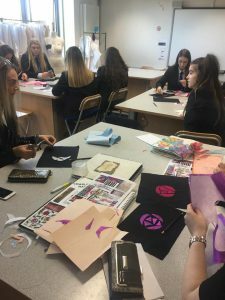 Tuesday the 12th of December saw the start of the Fashion departments Craft Fayre. There were some fantastic items up for sale displaying the many talents of our creative students. On the last day of the craft fayre they had cakes on sale made by our NC students. All proceeds of this sale will be donated to SAMH, watch this space for a final total. Glasgow Kelvin College was delighted to welcome some very important guests earlier in the week to its Springburn Campus; a group of inquisitive and enthusiastic 4 and 5yr olds from Sighthill Nursery School nearby. The youngsters were very excited to be given a gift by the College of their very own health and safety kit. As well as touring the Automotive, Joinery and Bricklaying workshops, the children got to try out bricklaying for themselves and helped to construct a garden planter. 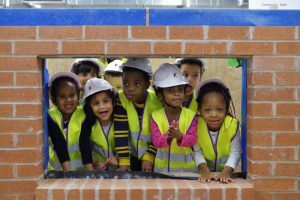 They were treated to a masterclass in bricklaying from first year apprentice bricklayer, Nicole Carlin, before getting the chance to build their own mini walls. Nicole progressed from an NPA Construction Skills programme at the College and has secured an apprenticeship with local employer, Cruden. Joinery lecturer, Tracy Burns, then helped the children to construct a planter which they will use in the nursery garden. On Friday the 8th of December, our dancers led a jazz dance workshop at Smithycroft Secondary School just along the road from our campus. 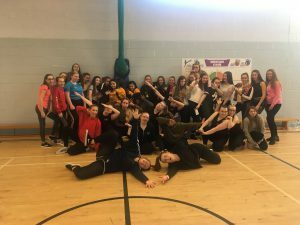 We currently deliver higher dance to Smithycroft pupils in our schools programme so we enjoyed working with some of the other pupils and giving them an insight into the dance courses. We worked with 3rd to 6th years and had a great morning. 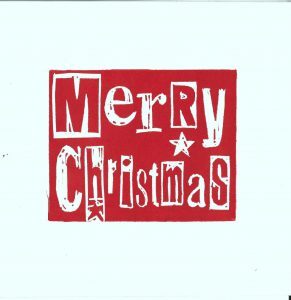 A big thank you to the Level 5 Hospitality and Level 6 Professional Cookery students at East End Campus who cooked and served a delicious 5-course Christmas themed Dinner to our Board of Management and esteemed guests on Tuesday 12th December. The students were supported by lecturers Ross Baxter, Drew Murray, Brenda Anderson and Jacqueline Simpson. 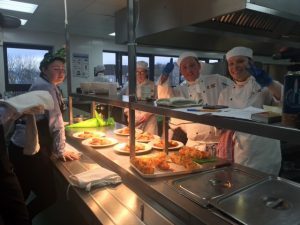 A big thanks to our Level 4 Hospitality, Level 5 & Level 6 Professional Cookery students at the Easterhouse and East End Campus have who cooked and served a whopping 325 Christmas lunches this year! For many of our customers (the vast amount being from the local community) coming to the Training Restaurants for this special celebratory 4-course meal is the highlight of their year. 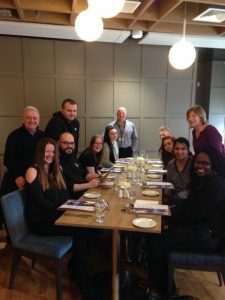 Students were supported in the kitchen by lecturers Drew Murray and Ross Baxter and in the restaurant by Brenda Anderson and Jacqueline Simpson. Just a reminder that the Training Restaurants will re-open in January. 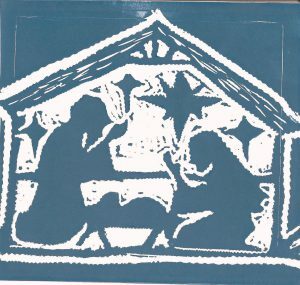 Bookings now being taken! 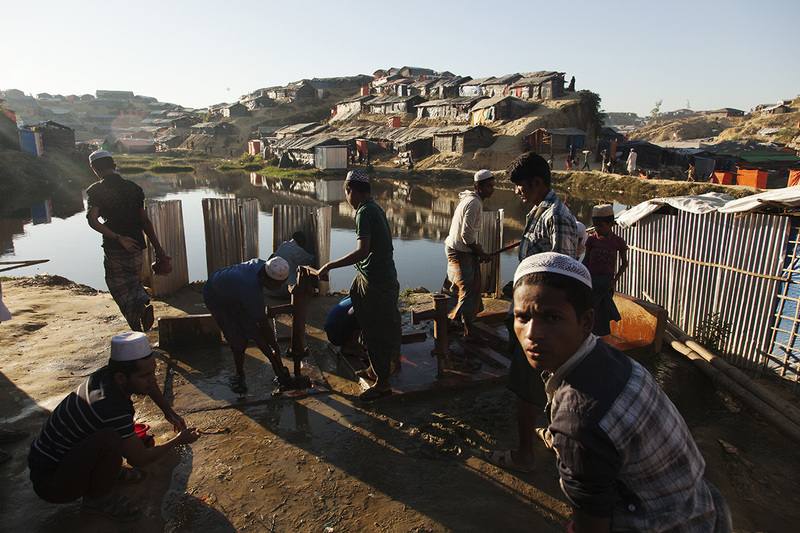 Photography Lecturer Simon Murphy has just returned from Bangladesh where he produced images to highlight the plight of the Rohingya refugees who have escaped ethnic cleansing in neighbouring country Myanmar. Simon spent time in the overcrowded camp where almost 1 million people live in desperate poverty and degrading conditions. Images from the trip will be published in newspapers from the 18th of December and will accompany reports on STV news by journalist Chris Harvey. 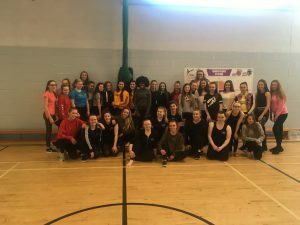 This project allows students to come to Glasgow Kelvin from a combination of EDC Secondary Schools, the students are from a variety of backgrounds and educational needs, with an onus on vocational skills development in sport! 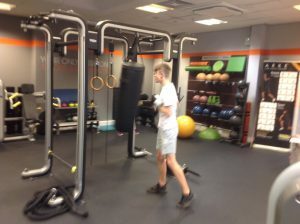 One of the students, Marco who is from Finland on an exchange visit, loved the peer learning, technique support and correction, reflection on correct loads, intensity, sets, reps and alternative exercises to overload certain muscle groups! Nice meeting you Marco and thanks for your feedback! 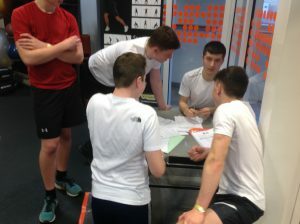 The project results in all students becoming gym members, all having personal programmes and all becoming leaders! 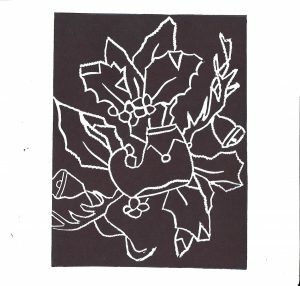 HND 2 art students have handmade Christmas cards for sale. 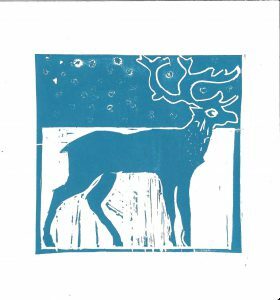 These are limited edition lino prints, 6 inches square designed and printed at West and £1 each or 5 for £4 with envelopes. They are fundraising for a London trip next year. If interested please contact Nancy at nancydocherty@glasgowkelvin.ac.uk. 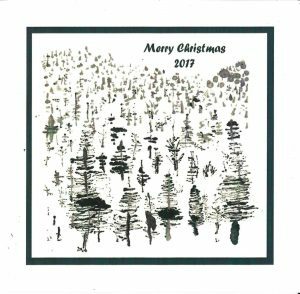 That’s everything for this week, but we will return next Friday for the final blog of 2017.